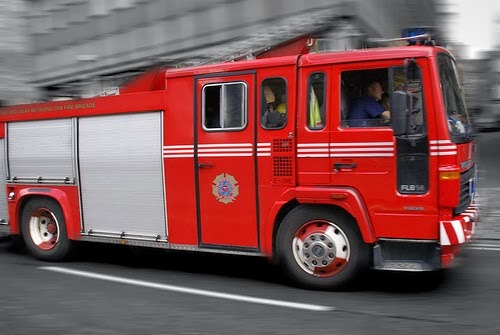 CX Journey™: Why Are Fire Engines Red? Well, books are read, and magazines are read, too. Two plus two is four. Four times three is 12. There are 12 inches in a ruler. Queen Elizabeth was a ruler. Queen Elizabeth was also a ship. Ships sail in the sea. Fish swim in the sea. Fish have fins. Finns fought the Russians. Russians are always red. Fire engines are always rushin'. And THAT is why fire engines are red. I used this riddle recently to address a situation that had gotten a little out of control. The initiative appeared to be humming along smoothly on the surface, but when you peeled back a few layers, it was actually a mess. And that's what the riddle represents: those layers - those non-cohesive, disjointed layers - of a project, a program, an initiative, etc. In this case, of course, I'm going to tie it to your efforts to improve the customer experience and your customer-focused culture (or lack thereof). What are my takeaways, from both the riddle and my situation that sparked a trip down memory lane? Leadership is key. Someone needs to champion the effort and inspire action. That's the CEO. In line with leadership is overall governance. Any effort to improve the customer experience requires involvement from an oversight committee and executives from across the business. There must be a clear line of sight between what you're doing and what the customer is experiencing. I'll write more about "line of sight" in an upcoming post, but this was the one topic that really stood out for me in that riddle: there's a goal there (identifying why fire engines are red), but it's a pretty muddled path to get to it. And yet, did we really get to it? Do we really understand now why fire engines are red? Be sure to understand and outline what the desired business outcomes are as a result of your efforts. At the same time, priorities should become clear. What's our purpose? Why are we doing what we're doing? Why do we care if fire engines are red? The riddle also made me think about process efficiency and customer effort. There's a better way to get from Point A to Point B. Don't make your customers (or your employees) jump through hoops to get a job done. Simplify. OK, this is similar to process efficiency, but in all things, keep it simple. Less is more. Communication is one of your most important tools. Answering questions and simply having a conversation both become more difficult when you can't say what you mean in a clear and concise manner. Communicate with clarity and with transparency, otherwise, your employees and your customers will be as confused as you are. When you start getting answers to questions like in the fire engine riddle, perhaps it's time to do some real root cause analysis. And sometimes, just sometimes, common sense prevails. I think your post also highlights the simple importance of communication. I love that, James! Yes, great point. Communication is so important, for so many reasons. I never knew why fire engines are red. Who knew! LOL! Now we all know!